Click on this link for the full 33-page Tuxedo Sterling Forest Host Community Agreement; and click here for an excerpted 3-page list of Payments Due under the HCA. Had Genting been chosen by the Location Board, almost $50 million dollars would have been paid by Genting to the Town of Tuxedo prior to the opening of the casino, to use for capital, beautification, and community projects and various impact expenses. In addition, the Town was guaranteed a minimum of $3.5 million in property tax intake and minimum of $7.4 million in gaming tax revenues per year. Yes, Sterling Forest was a plum location and would have generated more gaming revenues than Rivers at Mohawk Harbor. But, a proportional set of fixed payments from the Schenectady Casino to the City would have brought many millions of dollars into the City’s coffers before casino opening, and give Schenectady considerable security into the future. Direct Impact Payments: commitment to pay 100% of reasonable impact payments to mitigate cost of additional police, judicial, general administration and additional municipal services as a result of the gaming facility. Impact Mitigation: Upfront and ongoing payments for mitigation of all impacts, including private ambulance service, fire personnel, training costs and workforce development, traffic sewer, and water. In addition, Caesars committed $20 million to fund Town and Village traffic improvements. Nevele is firmly committed to ensuring that the projected impacts of the Project on the Host Municipalities and surrounding communities are adequately mitigated. To that end, we have spent considerable time and effort working with the Host Municipalities and surrounding communities to ensure the impacts addressed in the studies are recognized and understood, and that specific concerns of the local communities have been discussed. The culmination of this process is the Community Mitigation Plan Agreement (the “CMP Agreement”) that we have entered into with the Town of Wawarsing (the “Town”) and the Village of Ellenville (the “Village”). approx. $50,000 a year to promote local theater group and other cultural entities (through, e.g., ticket purchases). 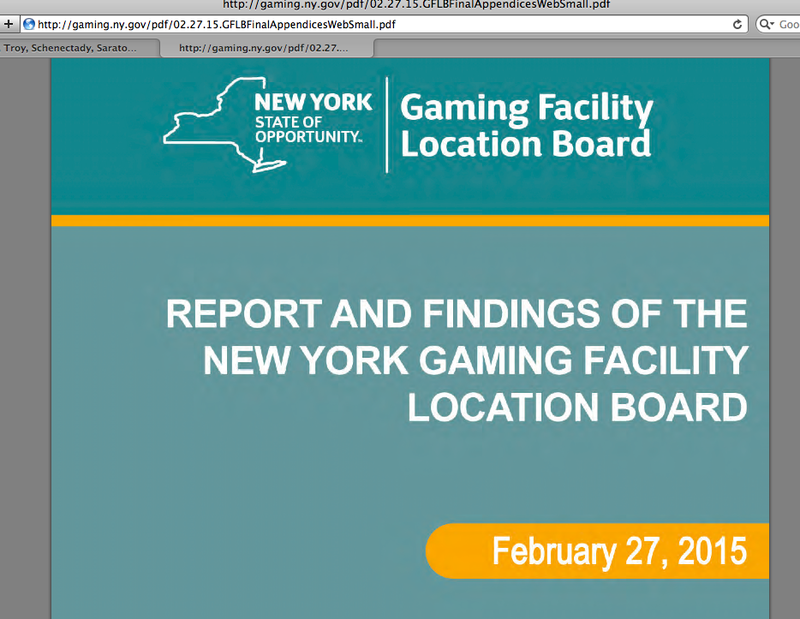 A quick look at the NYS Gaming Facility Location Board’s Report and Findings on its casino selection process yesterday, issued February 27, 2015, yields the following additional information about additional impact mitigation plans by casino supplicants during the 2014 location selection process. Our Rivers Casino at Mohawk Harbor committed to execute a number of traffic infrastructure projects, which were estimated to cost approximately $350,000. Unlike other applicants, the Schenectady developer does not offer to reimburse the State or City for work recently completed in the vicinity of its facility, or projects already planned and funded (i.e., the traffic rotary at Erie Blvd. and Nott Street) that are integral to the traffic infrastructure needed to achieve an acceptable level of service once the gaming begins at Mohawk Harbor, and to offering visitors an attractive entry into Schenectady. Hudson Valley Casino & Resort at Newburgh. Hudson Valley [“HV”] is placed last in this posting to give it a bit more emphasis. The HV applicant was a joint effort by two experienced operators of gaming facilities, Saratoga Casino and Raceway and Rush Street Gaming. At the same time that Rush Street was handing in its Schenectady application containing no extra mitigation dollars for the City, County, or nearby towns and school districts, the casino operator submitted to the Gaming Commission an application for the Hudson Valley Casino containing numerous little extras for nearby governmental entities. (See its “Executive Summary,” Exhibit IX.A.2a Local Impacts; and Exhibit IX.A.3 Mitigation of Impacts with MOUs.) The mitigation dollars were promised in Memoranda of Understanding signed by HV and the Cities of Newburgh, Beacon and Middletown, plus three school districts, and the nearby Dutchess County (to help with its baseball stadium and team and with tourism promotion). This Table shows the payments promised in the MOUs (notation in red added by this Editor), Ex. IX.A.3. 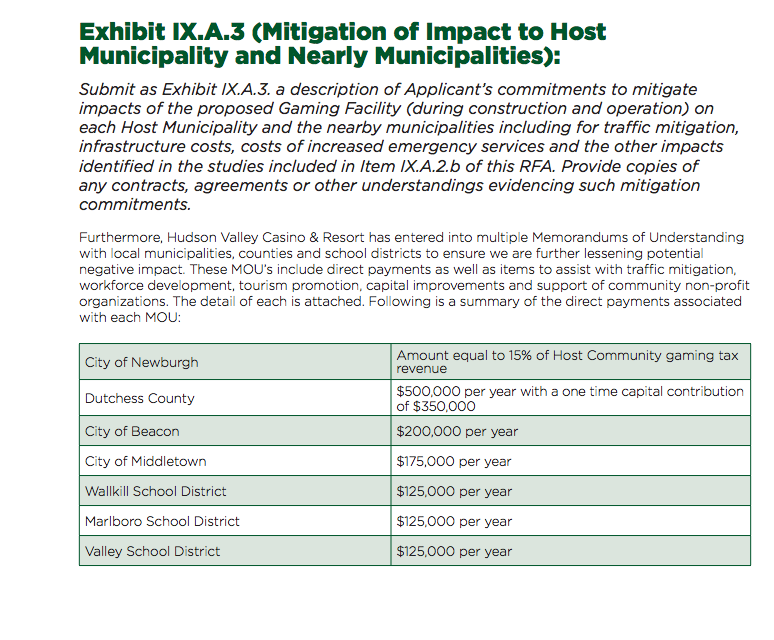 : As described in the Location Board’s Findings Report (at 98), in order to mitigate anticipated impacts, “and any other unanticipated impacts to the host and surrounding municipalities, Hudson Valley had entered into several agreements with local governments providing for one-time and ongoing mitigation payments. For example, Hudson Valley had committed to making separate annual payments to three local school districts in the amount of $150,000 each. Dutchess County would have received annual contributions of $500,000 each year and a one-time $350,000 payment. The Cities of Middletown and Beacon, pursuant to their agreements with Hudson Valley, would have been entitled to unrestricted annual payments of $175,000 and $200,000, respectively.” . 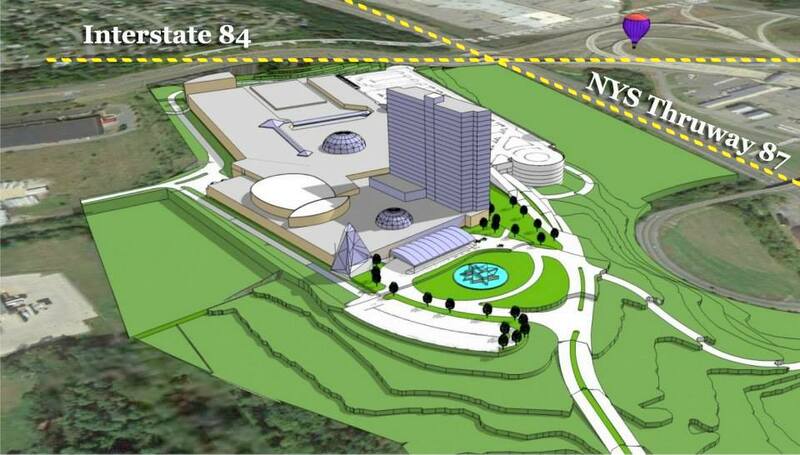 The Hudson Valley Casino applicants promised a total of approximately $2.5 million a year in “mitigation” payments, and threw in a $350,000 one-time upfront payment to Dutchess County. The single largest recipient under an HV Memorandum of Understanding was not the Town of Newburgh, which was the Host Municipality, but was the City of Newburgh, its contiguous neighbor. The Town offered to give 15% of its gaming tax revenues to its poor-relations City, and HV said it would give that same amount to the City of Newburgh, estimating a total of $2.5 million dollars a year ($1.25 million from HV) by its 3rd year of operation. The Hudson Valley Application stressed that the City needed help with its crime problem, and pointed to statistics and ratings at the website Neighborhood Scout, which gave Newburgh a Crime Index of 6 out of 100. Neighborhood Scout gives Schenectady a similarly dire Crime Index of 7 out of 100, and places both cities on its List of the 100 Most Dangerous US Cities. Nonetheless, Rush Street did not offer Schenectady one cent of extra mitigation money for public safety or crime prevention. In addition, the HV application notes that crime crosses municipal borders and has been found to spread out from casino locations along arterial roadways. The generosity of Rush Street’s Hudson Valley partnership contrasts greatly with its Schenectady Scrooge persona. Perhaps more surprising is the different conclusion at Hudson Valley about the connection between the incidence of problem gambling and the proximity of a casino. In Schenectady, Rush Street insisted to the Location Board that having other gaming facilities at Saratoga, Turning Stone, Atlantic City, etc., meant that “the addition of gaming at the Rivers Casino is not expected to lead to an increase in prevalence rates in the local area.” (from p. 50 of its Economic and Community Impact Analysis). Nonetheless, despite the wider array of nearby gaming facilities for the residents of Newburgh, HV’s application states that “the incidents of pathological and problem gamblers will increase as the convenience associated with full-service gaming is enhanced in Orange County. ” (Ex. IX.A.2a, at 30) Unbiased observers must wonder how much differently Rush Street and its Galesi Group partner would act if they had to actively woo the leaders of Schenectady, rather than being able to seduce them without even trying. Conclusion (for now). The above examples should suffice to make our point that Mayor McCarthy has failed to secure millions of dollars of payments and guaranteed revenues that should already be benefiting the City, its taxpayers, neighborhoods, and neighboring towns. Even if graded on a curve, he should be getting failing grades in political science, economics, public administration, tax policy, and negotiation skills. Furthermore, his empathy for impacted families and neighborhoods gets an Unsatisfactory rating. 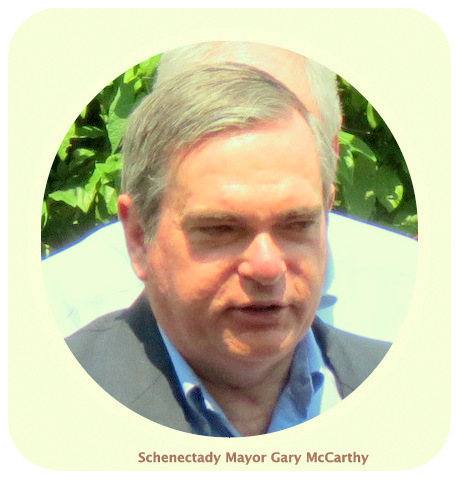 As said in our first MOTT posting, residents of Schenectady who favored the casino because of its potential to create added revenues and jobs for the people of Schenectady, as well as casino opponents (and supporters, too) who want to ensure that negative impacts of the Casino are minimized and their costs not be suffered by our families, neighborhoods or taxpayers, should be disappointed and angry. The many payments, promises and concessions made by Rush Street in Brockton and Philadelphia, and the wide variety of big and small commitments made by other New York applicants that are listed above, suggest the many ways we have been shortchanged, and underscore all that was left on the casino table by Mayor McCarthy. p.s. to The Mayor: Please let us know which of the statements of fact and law, or accompanying quotations and citations, above and in our earlier MOTT piece, amount to “misinformation.” Leave a Comment and we will link to it. Follow-up (May 27, 2015): See our post and related chart on Rush Street’s Giveaways (to everyone but Schenectady).